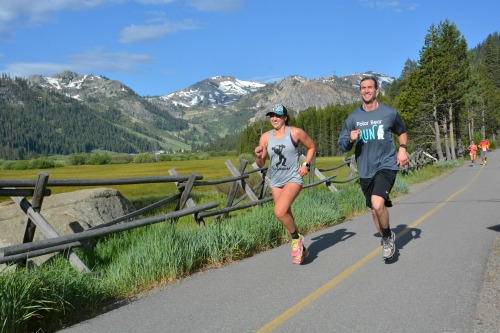 Register for the Squaw Valley Half Marathon and Run to Squaw 8 Miler today! Includes 2 to 3 of the following races. Additional race information can be found at http://squawvalleyhalf.com/. The Squaw Valley Half Marathon is supported by five aid stations along the course which will have water, electrolyte beverage and a variety of fruit and snacks. At the finish we will have the music pumping, a selection of recovery foods and some ice cold Lagunitas beer and soda to celebrate your accomplishment. The Run to Squaw 8 Miler course starts at Commons Beach with a stellar view of Lake Tahoe. It then heads on to the Truckee River Trail finishing at in the heart of the Village At Squaw Valley. There are 3 aid stations and course marshals along the way to cheer you on and make sure you are hydrated. Event check-in and parking is located at Squaw Valley. A shuttle takes you to the start at Commons Beach in Tahoe City. You then run back to Squaw Valley. Refer 3 or more participants and get a refund of $20.00! This refund will automatically be credited to your entry when 3 or more participants sign up when clicking on a referral from your Facebook account - you don't need to to do anything else!